Crazy Bear has a need for speed! 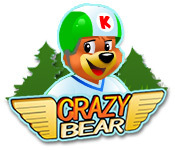 Help him navigate a daredevil urban obstacle course by board, bike, or ATV in this online game.Crazy Bear has the need for speed!Crazy Bear has a need for speed! Help him navigate a daredevil urban obstacle course on board, bike, or ATV in this action-packed arcade game. Use left and right arrow keys to move, and the spacebar to jump. Grab wrenches to help you fix your wheels when they break. Crazy Bear thinks avoiding oil slicks, spike pads, and other nasty hazards of the big city are the ultimate challenge!